These vegetables contain glucosinolates, sulfur-containing phytochemicals and studies reveal that consuming brassicas vegetables can significantly reduce the risk for a variety of cancers. Cabbage is one of the top brassica vegetables in the fight against cancer. In fact, cancer prevention tops all other areas of health research with regard to cabbage and the incredible benefits it provides. In fact, the word “brassica” translates in Latin into “cabbage” and is now used by researchers to identify the entire group of cruciferous vegetables. The unique properties of cabbage for cancer prevention are primarily due to 3 different types of nutrient benefits found in this super food. 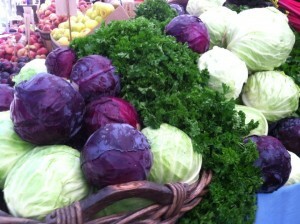 There are 3 main varieties of cabbage: green, red and Savoy. Bok choy and Napa are varieties of Chinese cabbage available. Antioxidant benefits: Cabbage ranks as an excellent source of vitamin C and a great source of manganese. Looking at the newer phytonutrient category, even among other brassica vegetables, cabbage ranks high with its high levels of the polyphenols, a phytonutrient antioxidant that researchers describe as the primary factor in cabbages’ overall antioxidant capacity. Even the very lightly colored green cabbage provides about 50 milligrams of polyphenols per ½ cup serving. Of course red cabbage is even more unique among brassica vegetables because it also provides about 30 milligrams of anthocyanin’s (red pigment polyphenols). These anthocyanin’s are not only antioxidant rich but anti-inflammatory nutrients as well. When we don’t have sufficient intake of antioxidants, our oxygen metabolism becomes compromised and a condition called oxidative stress occurs. If this becomes chronic, it can become a risk factor for cancer. Inflammatory benefits: The anthrocyanins found in red cabbage have been documented to be rich sources of anti-inflammatory compounds, making red cabbage stand out as an anti-inflammatory food, however all kinds of cabbage contain polyphenols which provide anti-inflammatory benefits. Rich in glucosinolates: Even beyond the benefits of antioxidant and anti-inflammatory richness, cabbage is a rich source of glucosinolates…another huge player in the “anti-cancer” war. Glucosinolates can be converted to isothiocyanate compounds that offer cancer preventive benefits for a variety of different caners including bladder, breast, colon, and prostate cancer. Different kinds of cabbage offer different glucosinaloates. Isothiocyanates made from cabbages’s gluconinolates act to protect us against cancer through a variety of different mechanisms. For example, they improve our bod’s detoxification system leaving our cells with a smaller toxic load to deal with, they help regulate inflammation by altering the messaging molecules within the body’s inflammatory system. There was a study done in Poland that showed impressive reduction in breast cancer in women who consume large amounts of cabbage (at least 4 servings per week in comparison to one per week). The health benefits of cabbage don’t stop there…they also offer digestive tract support as well as cardiovascular support. Cabbage is also an excellent source of vitamin K, vitamin C and vitamin B6 and a rich source of manganese, dietary fiber, vitamin B2, folate, potassium and copper. Cabbage also provides us a rich source of choline, B2, magnesium, calcium iron, selenium, pantothenic acid, protein, niacin and phosphorus. It doesn’t take a rocket scientist to see that cabbage needs to be in your weekly dietary plans…not once or twice but multiple times.